You see that up there? 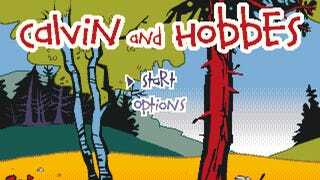 That up there is what we call wishful thinking, also known as a potentially awesome video game realization of one of the best comics there is: Calvin & Hobbes. Unfortunately it's currently just a concept work done by Johan Vinet. The first time I played Journey, I thought, "Okay." All My Life I've Been Told I Was Special. It Was A Lie. All My Life I&apos;ve Been Told I Was Special. It Was A Lie. So I&apos;m fighting this giant eyeball.